Heat oven to 350°F. Grease large cookie sheet. In 3-quart saucepan, heat chicken broth to boiling over high heat. Add pasta. Reduce heat; simmer about 12 minutes or until tender. Meanwhile, make Witches' Broom Breadsticks. Remove breadstick dough from can and separate dough at perforations. Fold each strip of dough in half, end to end. Cut two 1 1/2-inch slits in open ends of folded dough with kitchen scissors. Twist dough 2 times. Place on cookie sheet, slightly spreading end of broom. Repeat with remaining dough. Bake 10 to 14 minutes or until golden brown. Add meatballs, spinach and carrots to soup; simmer about 1 minute or until spinach is wilted. 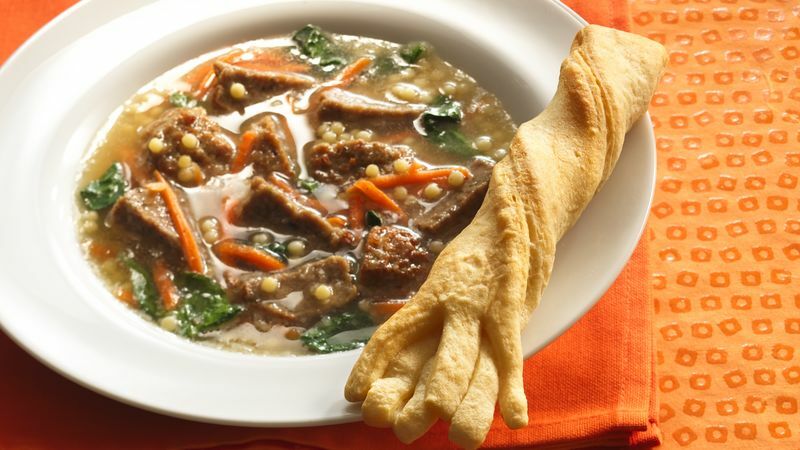 Serve broom breadsticks with soup. Kick off a night of trick-or-treating with a supper that's quick to make, fun and healthy. Double the amount of pasta for a heartier version.